One of the oldest, most important reasons for blacksmithing is tool making (if not the most important). A large part of that is making those tools from less-than-ideal or found materials. Professional smiths nowadays pretty much exclusively use "known" steels (i.e. bought steel whose exact composition is known), but hobbyist smiths and those from hundreds of years ago often work with unknown steel. This Instructable shows how to turn a rusty old coil spring found in a junkyard into a chisel that is capable of cutting through steel and other materials. First off--what's a cold chisel? In the world of machining before milling machines, lathes, or power tools of any sort, nearly all "machining" was done with cold chisels, files, and similar tools. An extraordinary amount can be achieved with these simple tools, sometimes even faster than they can power tools. A cold chisel is simply a stout, robust, hardened chisel used to cut away small pieces of steel or (nearly) any other metal. Similar to a woodworking chisel, though the shape and technique is slightly different. A tutorial very similar to this one can be found on youtube by Rory May (DirtySmith), who is an invaluable resource for smiths of any experience level. **Disclaimer** I am not a professional, nor do I claim to be one. Any attempt of this project is at your own risk, and can be dangerous to anyone not paying attention or comfortable using power tools. None of these methods are the only or end-all be-all way to do things, they are just what have worked for me. You can do this in a variety of ways, I used the hardy hole in my anvil to open it then flattened it on the face of the anvil. Do this by holding your material at the edge of the anvil, then strike the end with your hammer at a slight angle. As you forge this, it will want to spread out, so make sure to hit the sides to keep them straight. This is not the only shape for a cold chisel, so you can shape it however you want, but this is the shape I chose. For this style, you want the bottom to be flat, as it will allow you to reach into intended places. See the pictures for clarification. I also forged 4 flat sides, leaving sort of an octagonal shape with 4 of the edges radiused. This is simply for aesthetics. Step 4: Cut Off Your Material at the Length You Desire, I Chose About 6"
To cut it off, I used what's called a hot-cut hardy, which is just a stout, upward pointing blade that sits in the hardy hole. To do this, use even blows right above the blade, turning the material toward you so you can see the cut you're making and avoid spiraling. The key to doing this is to make sure you go to an even depth all the way around each pass, so that you cut right to the center. Do not cut all the way through, as you can damage both your hammer and your hot-cut, as well as sending the steel flying across the room. Cut most of the way through, then bend/break it off with tongs. This principle applies to any time you're hot-cutting material. You could just as easily do this with a saw, but you'd have to make sure to let the metal cool off first. Another reason to do it at the hot cut is it gives a slightly pointed end, which is desirable so you can avoid folding the metal on top of itself at the end ("cold shuts") when forging. I forged the striking end into a hexagonal shape, also for looks. The last step of forging is to stamp it as a signature. My touchmark is a simple, Runic "T". Stamping it will slightly distort it, so make sure to straighten the workpiece again. In order to make the steel easier to grind, we need to do a process called annealing the steel. This is achieved by cooling the steel off as slowly as possible from its nonmagnetic temperature, which basically relaxes the steel. To do this, bring it up to temperature then bury it in a bucket of Vermiculate or Perlite, which acts as an insulator. The shape is very simple, so grinding doesn't take long. I use a belt grinder here, but it can just as easily be done with files. This step took me around 15 minutes, and my guess is that with files it could be done in under half an hour, assuming the forging is neat. 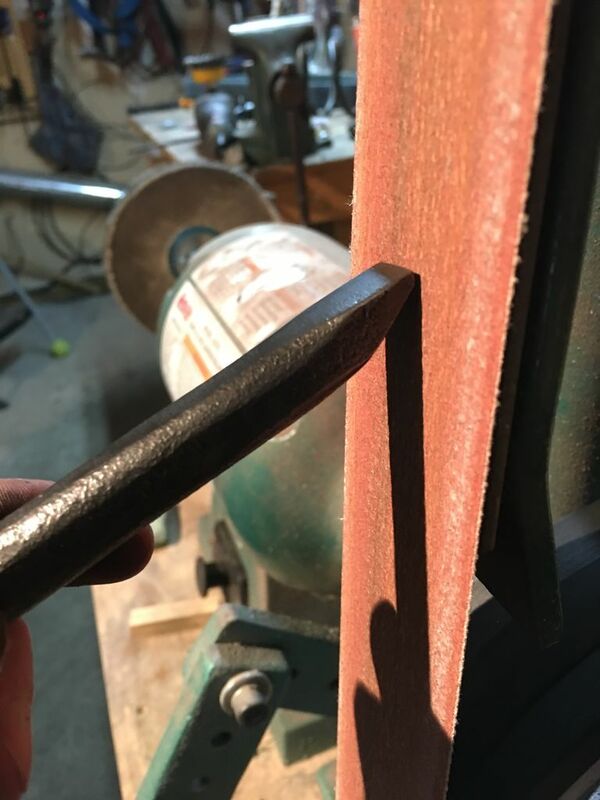 After its annealed, make sure to engage your safety squints and grind a perpendicular, flat edge onto the end, and clean up the angled flat, as well as the bottom. This is the basic shape and should be quite blunt. Make sure not to leave any sharp edges, as these will be prone to cracking in heat treatment. The key to grinding is to go slowly and be careful, having a clear picture of the geometry in your head. I formed a radius on the back of tool using the underside of the contact wheel along with the "slack" in the belt. I started with a 50 grit belt and went up to 120. This is the incredible part--where the steel gets its hardness. It goes from (relatively) soft to being able to cut through other steels. The basic principle of this is to bring it up to a "critical" temperature (approx. 1400 F for this steel), which is different for different steels, and then cool it off very quickly by quenching it in oil or water. This makes the steel very hard, but also very brittle. This process is called hardening. After that is tempering, which is heating it back up to around 400 degrees. This slightly softens the steel, but makes it much tougher and less fracture-prone. These springs are likely a similar steel to 5160 spring steel. It's worth noting that this process with these tools is not super accurate and will not bring out the full potential of the steel, but it still works quite well. First, we need to normalize the steel. This is similar to annealing, but not quite as slow. Here, just bring the steel up to where it won't stick to a magnet, then lay it on top of either a fire brick or the vermiculite. It also will work to hold it in the air. What this does is relax the steel a little more, so it's less prone to cracking and warping in the quench. Do this between 1 and 3 times. Time to quench! Bring the steel back up to non-magnetic* and quench about 2" in the oil until its mostly cool to the touch. Do not quench the rest of the piece, we're not done here yet. . .
Quickly take the steel out of the oil and bring it into direct light. Use some course sandpaper to scrape it and expose bare metal. You will see a small rainbow slowly moving across the steel-these are referred to as "temper colors." we're aiming for a light straw color at the tip for our application. If it gets to blue or purple it will likely stay too soft. The reason this works is that at different temperatures, different colored oxides form on the surface of the steel, which are amazingly accurate. Once the right color at the tip is reached, cool the rest off in oil. If the back of the chisel is still a bright red, only quench the working end until the back is no longer glowing. Otherwise, you risk hardening it. In my picture you can see the colors, it took about 10-15 more seconds after that moment. Something important that I forgot to photograph is to heat up only the striking end and let it normalize again. Make sure the working end doesn't get hot by dipping it or holding it in water periodically if you need to. This is not strictly necessary, but if it's not done it can be dangerous, because if the striking end is too hard chips can break off at very high speeds. Step 10: Secondary Bevel, Clean Up and Admire Your Work! Now it's time to add the secondary (edge) bevel. This should be quite steep and short. IT should go right to the edge, but doesn't need to be sharpened like a knife. All it needs to be is a nice, crisp edge. See my pictures for angle references if that doesn't make sense. One thing to be careful of is overheating the edge, you do not want any colors to show, especially not blue or purple. As soon the edge gets too hot to comfortably touch, dip it in water. This is another reason I didn't wear gloves. The edge and corners heat up very quickly. I used a wire wheel on an angle grinder to remove the scale, then polished up the working surfaces with a 120 grit belt, a scotch brite belt, and a buffing wheel. This isn't necessary, I just think it makes it a little sexier. Test it out on some steel and see if it chooches! If all went according to plan, it should be able to cut through about any metal short of hardened steel and other very hard metals. In the pictures I cut a chunk of mild steel and through a nail. I hope this helps in your own projects, as pretty much all of these principles extend beyond this example. 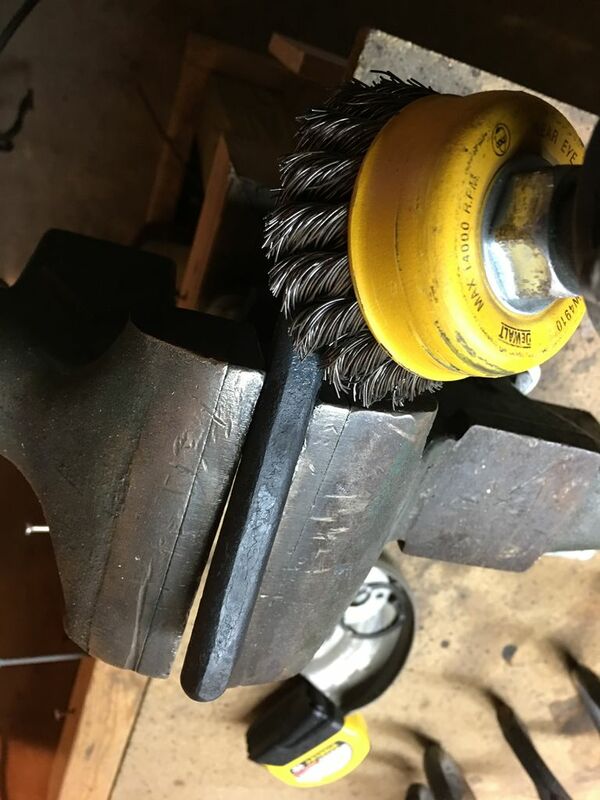 Part of the spirit of blacksmithing is solving problems in seemingly limiting situations, so don't be discouraged if you don't have the tools I have. If you enjoyed this project, make sure to check out my other Instructable on forging a Damascus Knife with a very simple setup. Thanks for reading! Hi there, just a quick note to mention a wee thing here that a lot of people are unaware of, and surprisingly even qualified engineers regularly do this too. The term cold chisel is incorrect. There is no such thing as a hot chisel, so why would we use the term cold chisel. It is in fact correctly known as a coal chisel. The name stems from the mining industry, where coal miners used them to chip away at the coal face prior to the invention of heavy machinery for underground work. To when i learned to Blacksmith; one of the tutors actually wrote a book on how to re-use scrap metal to produce tools (he worked for several years in the war-torn regions of africa helping produce farming and metalworking tools from scrap tanks;amongst other things!) he was also a master carpenter...VERY skilled man...so much so; i named my middle son after him...! When we made chisels,we used a coil spring from a lorry,straightened out the 'old-fashioned' way;by heating it in a coal forge,then hammering it out using sledge hammers wielded by two other people,over an anvil.took about 20 minutes to do the full spring. Vehicle coil springs or leaf springs are high carbon alloy steels (they have to be;or they would make lousy springs!) they are almost useless once they come off the vehicle, so have the other ideal quality; that of being (sometimes) free! The book 'the edge of the anvil' has a quick guide to what steels are used for what purposes,for re-use.The carbon-content can be judged by the colour and amount of sparks that come off it as it is put to a grinding wheel.. The method of heating isn't that important,as long as the metal is heated over a long enough length to get it straight without battering it flat...gas is efficient; but awkward to get a 'long' heat.hence using the forge,the length is only limited by the width of the hearth (about 4ft) and the coal helps retain the heat outside the hottest zone in the centre. If the metal starts to spark it is too hot;the sparks are the carbon being burned away,reducing its hardness.also,grinding away the point is not a good idea;the forgeing action physically changes the steels grain structure,grinding away weakens it. to make my 'pocket' anvil,i cut a section off the end with an oxy-acetylene cutting torch,turned it upside-down and re-welded it back on.so i had a flat anvil with a pointed bick AND legs at the front to anchor it to the tree stump.80) after burning my way through 4 cutting disks rounding the edges off...AFTER 'shaving' them to rough shape with 'ye gas axe'; like i say,this stuff is soooo tuff! Had to make one in Metals Shop in high School. We started with hex-shaped tool steel, heated it, hammered it into shape, then filed/polished it, reheated, tempered and hardened it. I lost mine somewhere along the way but it cut very well. Great project. Did you torch harden the cutting edge? Does it hold up? I made one once in my high school, welding shop class. We started with a 6 inch piece of 1/2 inch rebar, which we then welded onto one end to harden the metal and add some of welding rod material which had more carbon in it. We then heated it hammered the end down and cooled it before grinding it to form the chisel edge. After one more session of heat treatment to harden it we placed the finishing edge on the end of the chisel. Mine was one of the top three in the class - it was able to cut 3/8 inch sheet steel either flat or on edge without deforming the cutting edge. I still have it somewhere in the bottom of a toolbox. I don't use it much because it is sort of over the top for most things I do. I love the chisel shape, just perfect for so many jobs the common chisel isn't. I would like to add my 2 bits about heat treating a chisel: I prefer a chisel with the striking end a little hard so it doesn't mushroom so much. What works for me is quenching the whole chisel to make it hard and then "drawing it back" aka "tempering". After hardening you polish so you can see the colours and heat the middle up gently with a torch, playing it around until you get the straw colour on the cutting end and a deeper colour on the striking end. Don't heat the middle red, or even deep blue because you will notice a "springiness" when hammering, the middle needs to be a bit hard also. Spring steel was a good choice, high carbon and alloyed for "repetitive" shock loading, like hammering. You can make a pretty good chisel out of 1045, follow the above advise. Axle steels such as 4140 and 4340 are different in that 4140 is usually oil quenched. 4340 because of it's alloys is "air hardening" in that it hardens on cooling in air. - Air cool- some steels [4340 for example] harden at air temperature, they can be modified through heat treatment, another topic for another day. Thanks for a great instructable, I'm not a metal smith, but have always found it fascinating how metals are forged together and the different characteristics the modecules take at different temperatures and processes. Thanks for sharing the process! Its Instructables like this that help keep me sane in my apartment life... can't wait to get to a place I can build a shop! You could have saved yourself a lot of roughing though by hot working the chisel tip to something a bit better than that, surely? 15 minutes is a heck of a lot of grinding on a big belt sander. good work, too advanced for my skills. Nice step by step procedure and equally nice finished product. There is nothing wrong with reusing other material to make what you need. I do it all the time with discard items. Bravo sir Bravo.